APCH/DEP SERVICE PROVIDED BY FORT WORTH ARTCC ON FREQS 123.925/269.475 (TEXARKANA RCAG). 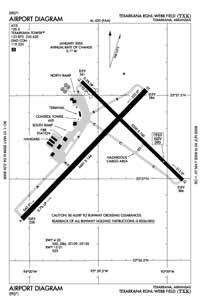 ATCT OPERATED BY ROBERTSON VAN BUREN ASSOCIATE INC.
A110-1 DEER ON & INVOF ARPT. A57-13 +55 FT TREE 1215 FT; 475 FT LEFT; APCH RATIO 22:1 BASED ON DSPLCD THR. A81-APT WHEN ATCT CLSD ACTVT HIRL RY 04/22; MIRL RY 13/31 & MALSR RY 22 - CTAF.